Older dogs are already less stable on their legs and they sometimes lose their confidence with their movements. If you have hardwood floors in your home, you will notice that your dog will have even a harder time walking through an area with hardwood floors. Hardwood floors are hard for older dogs to walk on. There are several things you can do to help an old dog slipping on hardwood floors in your home, other than removing your beautiful hardwood floor. Trim fur between and around the toes. Use rugs in traffic paths. 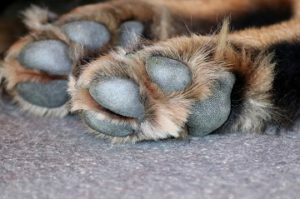 When your dog steps down on their paws, it puts pressure on the pads of their paws, and it extends their nails. If your dog’s nails are too long, they won’t be able to properly stand completely on their paw pad. If your don’t feel comfortable trimming your dog’s nails, you can check out the best way to trim dog nails for some tips for making it easier. If you hear clicking when your dog walks on a hard surface, their nails are too long. Depending on how furry your dog is, especially in the winter months, dogs fur can get pretty long around their toes and in between their toes. With long fur getting under your dog’s pads, it creates a more slippery surface that your dog is trying to walk on. This should be something that you can handle yourself, or otherwise you could take your dog to a groomer for just a paw trim and it should be fairly inexpensive. Putting out runner rugs on the paths that your dog usually travels will help prevent them from sliding on the floor. Make sure it is a rug that will remain laying flat so you don’t create a tripping hazard for your dog or your family from a bunched up rug. If your dog lies on the hardwood floor, I recommend either placing a dog bed down for them, or a rug where they lay. It will help them get up easier by not having their paws slip out as they are trying to get up. Depending on how you have been cleaning your floors or if furniture polish has gotten on your floors, they can end up being more slippery than they originally were. You can combine 1 part vinegar and 2 parts water. Mop the floor with this mixture and if it is too wet, wipe the extra water from the floor. This will remove and old waxy residues that you might have on your floor, including grease from cooking if your wood floor is in the kitchen. When your dog’s pads are healthy, they should be soft and pliable, similar to our skin. A dog’s pads take a real beating with the walking they do on all kinds of surfaces and all kinds of weather. When your dog’s pads become dry, they lack the ability to grip like they normally would. This will cause the paws to slide when walking on smooth surfaces like a wood floor. The product I recommend for moisturizing your dog’s pads is Certified Organic Nose and Paw Balm made by 4-legger. It is an all natural product made with organic hemp oil, shea butter, rosemary extract, vitamin E, calendula extract, St. John’s Wort and beeswax. . These are the only ingredients in the product. It is also 100% USDA certified to food standards, since dogs tend to lick their paws, you will know your dog is safe if they lick their paws. It will sooth your dog’s pads and heal dry, cracking and rough pet skin. A moisturizer will protect and restore your dog’s pads. It is non-toxic and is packed with antioxidants and anti-inflammatories to help revitalize and heal skin. This product can be used on your dog’s pads, their nose and can even help with hot spots. While both traction socks or boots will work for helping your dog from slipping, I recommend traction socks over boots. Boots aren’t quite as comfortable as socks are, and most dogs don’t like wearing boots for long periods of time. Boots can also sometimes cause some irritations on your dog’s paws if worn too long. Traction socks are soft and comfortable, meaning your dog won’t be trying to get them off their feet. Although most can be worn outside, I recommend using them just inside. They aren’t as sturdy as dog boots are. Traction socks are like slippers for your dog. Traction socks will also protect your hardwood floors from getting scratched from your dog’s nails. If you decide to go the route of traction socks for your dog, I recommend the Expawlorer Anti-Slip Dog Socks. They are very reasonably priced and do the job of preventing your dog from slipping on your floors. They provide traction control for indoor wear. The grip socks will prevent damage to hardwood floors and provide traction. There is an anti-slip silicone gel print on the bottom of the socks for traction and soft enough for your dog to wear all day. The traction socks should be tight enough to stay up, but loose enough to pull off easily. An added bonus of the socks is that it will prevent your dog from licking their paws and causing irritation to their paws. This variety of traction sock comes in x small, small, medium, large, and extra large, making sure you can find a size that fits your dog properly. If you are interested in style or fashion for your dog, they are available in black green, red and red & black. Traction pads that you apply directly to your dog’s paws are a great concept. It is similar to applying a band-aid. You just peel off the backing and press it onto your dog’s pads. They are great for senior dogs, especially because most older dogs aren’t moving around as much and aren’t doing as many activities outside. They have a lower activity level meaning the traction pads will last longer. Placing a rug where your dog sleeps will help them get up easier. How long the non-slip traction pads will last vary, depending on moisture, humidity, extreme cold and the type of surface your dog is walking on. Most consumers say they stay in place from 2 days to a week, but they are relatively inexpensive. They will help your dog from slipping on hard floors, and will help your dog to regain their confidence when they are no longer slipping and falling when walking around your home. They also protect your dog’s pads on hot pavement. You should trim the fur between your dog’s pads before applying the non-slip traction pads. Recheck the fur length every week to keep it trimmed back. If you decide that you are interested in trying out traction pads for your dog, I recommend the Loobani Pad Grips. The price is right, and they stay on better than many of the more expensive ones. Loobani pads are made of a soft and toxic free material. They use a special hypoallergenic certified adhesive that is a breathable texture. They are sold as 48 pieces per pack which would give you 12 sets of traction pads. Sold in either black or assorted colors. It is best to put your dog’s paw on a piece of paper, making sure they have weight on the paw and trace the paw and measure the size to get a proper fit. Here is a general guideline for sizing of non-slip traction pads. Small 4 to 10 pounds, medium 11 to 20 pounds, large 21 to 40 pounds, extra large 41 to 60 pounds, and extra extra large 60 to 80 pounds. Remember, the amount of time they will stay on your dog’s paws varies, but the results are good with this product and they aren’t very expensive. There are many things you can do to help prevent your dog slipping on hardwood floors, and several of them won’t cost you any money to do. Maintaining your dog nails and the fur between the pads is the first step you should take. Rugs also work great by placing in their main traffic paths. If this doesn’t keep your dog from slipping on the floor, I recommend trying one of the several other recommendations that I have listed. All of them are inexpensive ways to help prevent your dog from possibly getting injured, build their confidence and give them back their dignity from not falling. Our dogs give us so much joy over their lifetime, now we need to help them when they need some help from us. If you have any questions or comments, please leave them below. Please share if you have some great ideas that I haven’t mentioned that have worked well for you for preventing dog slipping on hard floors. 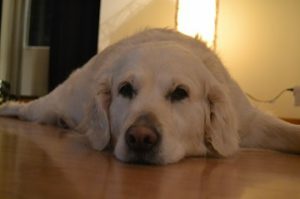 You can follow justforyourdog.com on Pinterest, FaceBook and Twitter for all of the latest updates. Thanks for sharing this informative and educative article. This article really came at the right time. 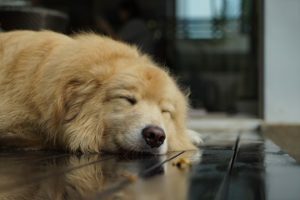 I have an old dog and this article has really informed me on how to help my old dog not only from slipping but on some other things. This article is a must read for everyone who has an old dog or even a dog. Thank you for reading and I am glad you found the information valuable. Since you mentioned you have an older dog, I also recommend you reading about Orthopedic Dog Beds For Older Dogs and High Quality Senior Dog Food. Both might be of use to you and your dog. Thanks for sharing this article here. Pets needed to be cared for and looked after. I found this article on your site to be informative and helpful in helping my dog from slipping. I must commend your effort in taking time to write and post this article on your site for easy access. Thanks you for this. I will follow the steps to listed. Thanks. It is amazing that as dogs age, they have more needs than they do as a puppy. So many things are changing for them, and there are many adjustments you will have to make around your home to help them out. It might be helping them on slippery floors, or it might include having to provide them with an easier way to get on your furniture, down some short stairs, or a ramp for them to get into your vehicle. It is all worth it though. Thanks for reading, and I am glad that it could provide you with some helpful information. Great post! These are good tips to help your dog to better manage hardwood floors. I didn’t realise that there were so many options available so thanks for putting this together in a simple and easy to follow structure. This is definitely a great resource for dog owners. I look forward to reading more. Thanks Cyndy. I hope you stop back often for all your dog needs and information. Marla, thanks for your post. Some great tips there for helping an old dog from slipping. I particularly like the idea of traction socks! I can see that an unsteady older dog would be upsetting for an owner to see so these ideas would really give assistance to dog owners for a problem that I imagine is not uncommon. I am glad you found some value in my article James. It can be very hard to watch your dog slipping on the floor, and it is sad watching them lose their confidence from not being able to do what they once could. All of the suggestions that I listed will help to some extent in making it easier for a dog to move around on hard floors. The tractions socks work great, since they should eliminate any slipping and help with an older dog’s confidence. Hi Marla, I must commend you for a thoughtful article. As a dog owner I have not really put this into consideration. Reading through your post, makes it so logical why hardwood floor is not ideal for aging/older dogs. Yeah, long fur can add to frequent slipping on the part of the dog, especially the hardwood floor that is reliable to slipping. All the tips you listed here are quite on point. Thanks for your recommendation of Traction socks as it can also help in reducing slipping in dogs. Thanks for reading Gracen. There are many things to help an older dog from slipping on hardwood floors. The traction socks work great, since no matter where they are walking, your dog will always be protected from slipping. Not all dogs will accept the traction socks, but if you have one that doesn’t mind them, it is a great solution for helping your dog from slipping. I have an old dog that lives with me and he always has this issue. I changed my floor a couple of years ago but I just didn’t think it would bother him. But I see him slipping a lot of times. Luckily, he always gets up – but what if he won’t be able to do it anymore at one point, because of age? Thanks a lot for these tips, I already added a few rugs throughout my living room and that seems to help him. I was thinking about adopting a puppy, do you think he could have this problem with slipping too? Thanks for reading Ashley. I am glad you have added the rugs. It is something that can be done quickly and is the easiest fix for your dog slipping on hard floors. Puppies generally have a problem with slipping more because they are usually going too fast, and they are still working on their coordination that causes them to slip so much. Their pads are in much better shape than older dogs, and will be better suited to grip the floor. Good luck with your new addition to the family. Thanks for these amazing tips you shared. I particularly love what you said about putting rugs along paths the dogs normally passes. My elder brother has a Caucasian Shepherd dog that is becoming overweight and lethargic due to age. I noticed that the dog sometimes tends to slip on the pathway even when the floor isn’t wet. I’ll suggest he gets runner rug on the corridor floor. Even though the dog is 6 years old, it still has destructive habits, so, using a traction socks or boot isn’t going to work. Can you write an article on how to curb destructive habits in adult dogs in the future? Thanks for reading and commenting on my article. I do think that a rug runner would really help your brother’s dog from slipping. I have an 11 year old, and he was having many problems on my floors, so I added rugs in many of his main paths. I also added rugs where he turns corners, since they seemed to be areas where he had more difficulties. I will write an article on curbing destructive habits and thanks for the suggestion. I’m not what your brother’s dog is doing, but here is a reference article about how to stop a dog from chewing furniture if that helps. This is a great enlightenment. I have learned alot of things from here. Yes, I agree with you that I a dog wear a boot for too long on it’s paw, it can cause irritation. I have seen incidence like that before. Dog can be so naughty at time, especially when they are growing old. I am so glad and happy for your comments. Dogs are very special to me, and I currently have a senior dog that I am surprised how quickly time flies of him being old. He is the inspiration for many of my articles, as I try to make life easier for him as his mobility is getting harder. He gives me lots ideas on how to help other dog owners make life better for their dogs. Please do come back again. Oh Marla, this a very helpful piece especially for people who just got new pet and wondering what to do about the falling. Or even those who are keeping pets for friends or family while they go on vacation. And the best part is that they are inexpensive, so should be quite easy to implement. Thanks for sharing. You have a great point about when watching someone elses dog that they could have problems at your home if you have hardwood floors. For a guest dog, putting down the rugs would be the easiest solution to help them from slipping on your floors. Awesome article!, I loved the reading! I have two big dogs, but I don’t have a hardwood floor, so they don’t have any problem to walk. My sister though has a hardwood floor, and she has a poppy, and he is slipping all the time. What would you suggest for puppies? Should she follow the suggestions in the article, or do something else? Also, are there pas for little puppies? Puppies usually have more problems because they are running too fast and don’t have complete control over all their body parts yet. I would probably make sure the fur between their pads is trimmed short and add some rugs in their main paths until they get it figured out to slow down a bit. These are wonderful tips that you have just introduced to us here on how to help an old dog slipping on hard wood .Old dogs needs to be taken care of though some people don’t fancy doing anything with old dogs anymore. Some would say that it’s becoming tiring for them taking much care of old dogs. I feel that dogs leave our life’s way too soon, so having to do a few extra steps to help an older dog along really shouldn’t be a burden for a dog owner.